than among those whose water does not contain chlorine." See the basics of pH, in relationship to the body, in this short informative video. 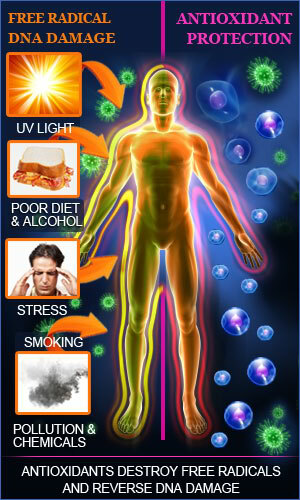 How body pH affects our health. How acidic environments in the body lead to disease. How pH affects how fat is stored in the body. 2. Alkaline water has ions (lots of them) to help balance and maintain a proper body pH. This creates an environment that inhibits bacteria, inflammation and disease. 4. The Alkal Life 7000sL filters out most Heavy Metals! The Alkal Life Water Unit also creates Acidic Water! Acidic Water can be used as a disinfectant without boiling. anywhere 'disinfectants' would be used. can directly determine the quality of our health. Approximately 70-80% of our body is water. Water adjusts the body's temperature and assists in digestion. It removes toxins from the body and also makes necessary body fluids. Alkaline ion water tastes "wetter". The molecules are much smaller (5-7 per cluster). This small cluster size makes the ion water super-hydrating, or more absorbent. Since our bodies will have more water to work with, it can deliver more nutrients to all of it's many parts. As we age, each of our cells actually become a bit smaller and the access points of our cells for nutrients and water also get smaller. This is why micro-clustered water is important, because these smaller water molecules can now enter and hydrate the many cells that were 'parched' before! Although this small cluster size enables our bodies to readily absorb nutrients, it is also able to transport nutrients and eliminate the waste within a half hour (it would take our body 2.5 hours to do the same thing with ordinary tap water). WOW! What else is unusual about Drinking Alkaline Water? Alkaline ionized water is different from the other waters that we drink. It contains ions, has a different boiling point, viscosity, surface tension, and can enter our body cells three times faster than ordinary tap water. The molecular structure is smaller than that of normal tap water, thereby allowing more hydration and better detoxification. In general, the water we drink is poorly filtrated and exposes us to all kinds of toxins and pollution. On the other hand, alkaline ion water removes impurities, and activates healthy minerals into an ionic form which produces "living water". Alkaline ion water is a powerful liquid anti-oxidant that readily absorbs into the body and neutralizes free radicals. Free radical damage causes us to age faster and is largely responsible for many diseases, including cancer. The alkaline ion water balances and maintains our proper body pH level (6.9 - 7.2) which creates an environment essential to deterring bacteria, inflammation and disease. We've all heard the terms "free radicals" and "antioxidants." but do you know what they really mean? Free radicals are unstable oxygen atoms that cause oxidation in our bodies which brings about aging and disease. Oxidation is what turns an apple brown after it is cut or causes metal to rust. The process of oxidation "steals" electron from the surface being oxidized. Antioxidants work by significantly slowing or preventing oxidation. Drinking ionized alkaline water helps scavenge free radicals in the body. It is nature's greatest antioxidant, laden with negatively charged hydrogen atoms. Why is alkalinity important? Our bodies function best when they are neither too acid or too alkaline. Our blood system is always working to keep itself in the narrow range of pH 7.35 to 7.45. Alkaline water can neutralize the acidity of the body caused by stress, modern diet, air pollution and many bottled waters. An acidic body is a breeding ground for disease. Drinking ionized alkaline water greatly enhances the physiological process responsible for attaining and maintaining a relative blood and urine alkalinity. Alkalizing increases the body's natural defenses and strengthens immunity. The Alkal Life 7000sL Water System assures you that the pH level you select is precise and completely accurate. This is the only pH calibration system that filters all types of water to guarantee you are getting the best water quality available. Tests from across America and every type of water from big city to small town, from wells to hotels were conducted to ensure each unit would work optimally in each location. A unique feature of the Alkal Life 7000 sL. With the Alkal-Life 7000sL™ you are investing in your future. This machine is equipped with an advanced pH calibration system which allows regular tap water to channel through the process of ionization effectively. The diagram below shows the process of ionization. Notice that regular tap water from your faucet first enters through a 6-layer purification filter. Next, purified water travels through electrolysis, where precise ionized water is produced. By changing the pH setting, the Alkal-Life 7000sL™ has the ability to perform many functions from acidic to simply purified water to alkaline ionized water. The electrolysis process, in addition to altering tap water into a desired pH (potential hydrogen) level, also compromises the Oxidation Reduction Potential (ORP). Altering molecules into micro clusters achieves the remarkable production of antioxidants! A negative (-) ORP number is a crucial element to maintaining good health Consuming food and beverages high in acids (+) ORP on a regular basis creates oxidation to the human cells. This can make an individual vulnerable to disease and speed up the aging process. The Alkal-Life 7000sL™ , inspired by leading researchers in Asia, will deliver pristine water that has a higher absorption rate - a taste you can feel! 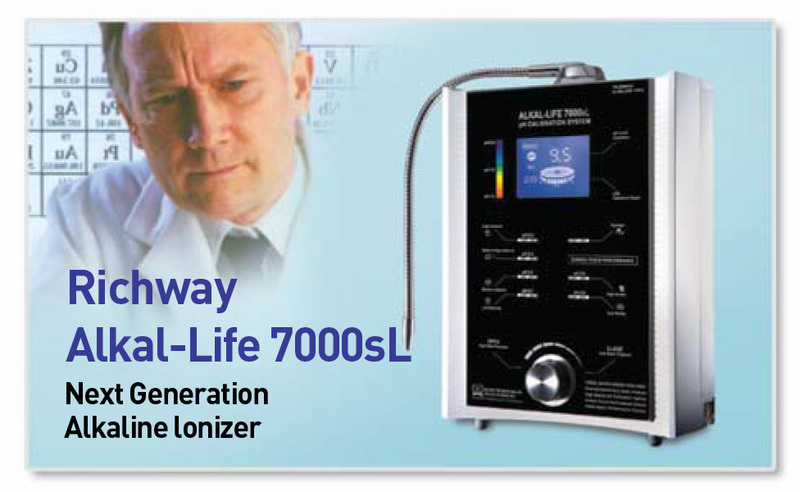 Tested and proven to have a low ORP, we challenge you to try the advanced Alkal-Life 7000sL™ water ionizer! RichWay's Alkal Life Water Unit fits on the counter-top with installation in minutes. It is by far the most affordable product of its kind. is one half to one third the price of a typical Kangen unit. And with the same quality, craftsmanship, versatility, warranty, and lifetime as these units. It's quite the deal actually...and no need to purchase bottled water again, you save $$ and the landfills. Rice: Soak in alkaline water for thirty minutes to one hour before cooking. It makes rice sticky and improves the taste. Hangover: Drink 1 to 2 cups of alkaline water on an empty stomach in the morning or before sleeping. Cooking: Alkaline water retains the vitamin and mineral content of our foods that are normally lost in the cooking process. Flavors are enhanced, and any acrid or bitter tastes associated with the foods are eliminated. The "fish" taste of seafood is also removed when you prepare and cooking with alkaline water. Plants: Use alkaline water to help step up the growth of roots and promote growth by bringing acidic soil into neutrality. The acidic water serves as a disinfectant that protects the stems of plants from disease and harmful insects. Liver, Pork, Game Meats and Fish: Soak in alkaline water 20-30 minutes before cooking. Alkaline water softens (tenderizes) the meat and removes foul odors and the bitter after taste or "bite". Formulas for Babies: Add alkaline water to powdered formula to promote growth and sturdy bone structure. Rejuvenates and energizes the body: Drinking on a regular basis improves the energy in the body. Open Wounds: Eliminates parasites in open wounds. Heat, Rash, Eczema, Cuts and Burns: Acid water has superior disinfectant qualities. Dip the affected area in acidic water, or apply acidic water to the affected area for relief. Disinfects cuts & abrasions. Washing / Bathing / Shampoo: Acidic water softens and adds elasticity to skin and hair. Nourishes & strengthens hair follicles. It's astringent quality helps prevent acne, age spots and freckles. Stains on Clothing or Carpets: Acidic water breaks down stains without the use of harsh chemicals and doesn't discolor your fabrics. Disinfect Surfaces: Use acidic water to disinfect tableware, utensils, counter tops, sinks, showers, toilets, tile & ceramic floors, refrigerators. Spray and allow to dry. Acidic water is used throughout the U.S. from government buildings in Minnesota to the cutting boards and kitchens of some of the finest restaurants around. Certified as a medical device by the FDA of the U.S. Government. Filter: Water cleaning cartridge service life: Sufficient for filtering residual chlorine from 7000 gallons of tap water. Approximately 6 months. Electrolysis tank cleaning: Double auto-change cross-line system.